About two years ago I posted my top 10 problems and that post actually led to the solution of one of those problems. So I am trying here, again, and my list today is somewhat different, due to progress made in several areas. 1. Catherine Young (Bennett) (Baldwin) Ross (1832? – 1907). The first “gap” in my mother’s family tree is for the parents of my gg-grandmother, Catherine Young (Bennett) (Baldwin) Ross, known as “Grandma Ross” to my grandfather. Grandma Ross took my grandfather in for a while after his mother died and his father was busy with other things. He knew about her three marriages because he scrawled all the names on the back of this picture – he was descended from her second husband, Edward Baldwin. Catherine was born in Surrey, England, possibly 04 Jun 1832. The borders of Surrey were altered around that time, making this extra-difficult. Her father’s name may be William B and her mother, Catherine (from her death record). In the 1900 census she gave her immigration year as 1843; the 1905 census says 1840. Searching English census records, ship passenger lists and American records has turned up a few speculative possibilities but nothing that seems to fit together. My earliest record for her is an 1860 census record with her second husband at Belmont in western New York; eventually she had four children, William Blackstone Bennett, Anna Jean Bennett, Harriet Elizabeth Baldwin and Miles Edward Baldwin. I have found no trace of any member of her original family. try and pin down her elusive first husband, William Bennett, who was born in Massachusetts. I suspect she was divorced rather than widowed. Keep investigating the idea that her first marriage might have taken place in Massachusetts, and even the divorce could have happened there. It did not happen in Allegany County, New York. Keep pursuing possible clues from DNA. Catherine Baldwin, circa 1900 on Marshall Street, Providence, R.I. around 1900. 2. Sarah Arnold (1776? – 1861?). 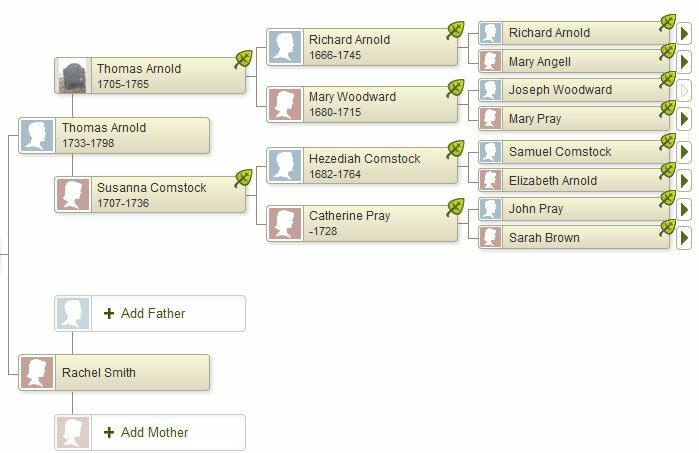 Having confirmed my relationship to Sarah’s husband, Jesse Andrews, I now need to move on to determine which part of the large Arnold family in Warwick Sarah’s father, Joseph Arnold, is from. That name is pulled from Sarah’s 1795 marriage record in Warwick, Rhode Island. Sarah is, as far as I can tell, not mentioned in The Arnold Memorial or other books published about the Pawtuxet/Warwick Arnolds, which probably means that she was not mentioned in any local birth or probate records (although I continue to check). A Joseph Arnold is sometimes noted nearby Jesse and Sarah in census records. This would be an ideal common-name problem for me to tackle because I have good access to many records. No excuses! make my own documentation of all possible Joseph Arnolds, using vital, probate and land records in Warwick and East Greenwich. try to pin down any further details of the neighbor Joseph Arnold, including nearby possible grown children. Explore Joseph Arnold more widely in court, military and cemetery records. I do not know the names of most of Sarah’s children, but continue to try and find those names, possibly in Norwich, Connecticut, as hints to her family. One of several pages of Joseph Arnold deeds indexed at Warwick City Hall. Note the “S.D.” and “S.W.” indicating “Son of D” and “Son of W”. Not every deed has that, of course. That would be too easy. 3. James Lawrence (1807-1882). My 4x-great grandfather James Lawrence was born in England in 1807, and his father’s name may have been James. In 1835, he married Ann Shortridge (Shortriggs) in Dorchester, Massachusetts. The next twenty years found them in North Carolina, Virginia, Georgia, and Connecticut before ending up in Providence by 1860 with several of their almost-grown children. According to the 1865 census, he was a machinist. If I could learn more about James’ origins, it might help me to verify my complicated relationship to the Lawrences through DNA testing. Keep looking for ship passenger records and court naturalization records for James. Other than birthplaces listed by his children years later, I am having trouble pursuing him across the eastern U.S. through the 1830’s – 1850’s, although I do have an 1850 census record for them in Virginia. Try finding clues from that for further research. Learn more about Dorchester resources such as directories, businesses, and immigrant populations there. Places of birth for James’ children, from the 1865 census: England, South Carolina, North Carolina, Connecticut, Rhode Island. 4. Jessie Ruth MacLeod Murdock (1861-1936). Thanks to a helpful cousin who saw my blog post, I learned about a 1954 local genealogy book written by the nephew of my brick-wall gg-grandmother back in Pictou, Nova Scotia. That was a great moment, but imagine my surprise as I obtained the book and saw her listed as “adopted” – a sentiment I do not believe she shared. Although I now know more about my gg-grandmother Jessie’s early life in Pictou, Nova Scotia, I continue to know nothing about her mother, Rachel, and her relationship to the people who may have adopted her, William and Mary MacLeod. Jessie came to the U.S. around 1881, according to the 1900 and 1905 census. I can find no evidence of her journey or any relatives coming with her. She married Louis Murdock in 1883, making me wonder if she was related to Louis’ adopted father, William Murdock, also from Pictou. There are some Rachel’s in the Murdock family. 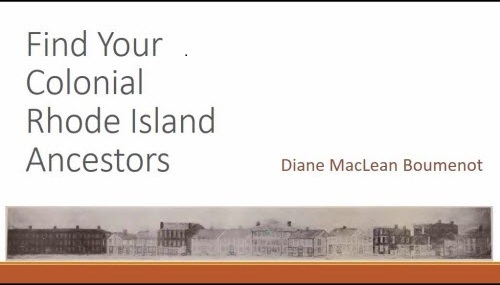 investigate land and probate records of the Murdocks in Pictou through microfilm at the New England Historic and Genealogical Society library in Boston. see if the name of her third daughter – Jessie Ellen – can be matched with any people from Pictou. 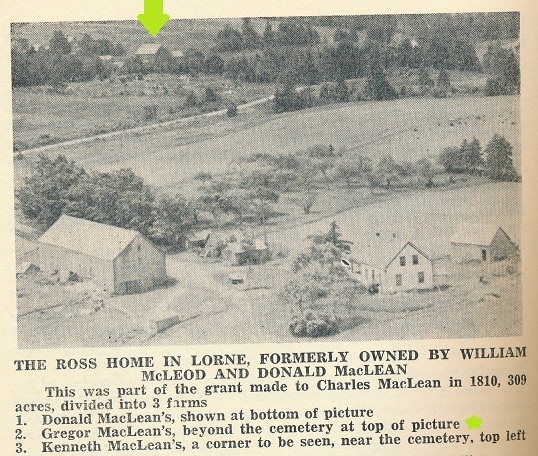 The farm in Lorne, Pictou, where Jessie MacLeod spent her teen years, from page 192, The Pioneers and Churches. 5. Lydia Minor (1787-1849). Now that I have solved the Andrews problem, I plan to move one generation back to the Lydia Minor problem. She married Russell Lamphere in Norwich, Connecticut in May, 1807 “At Preston”, as reported by the announcement in the Norwich Courier. Lydia and Russell had seven boys and seven girls in Norwich Falls, Connecticut. No vital records for the marriage, the children, or Lydia’s death has been found. A Norwich Courier notice indicates she died 18 January 1849. 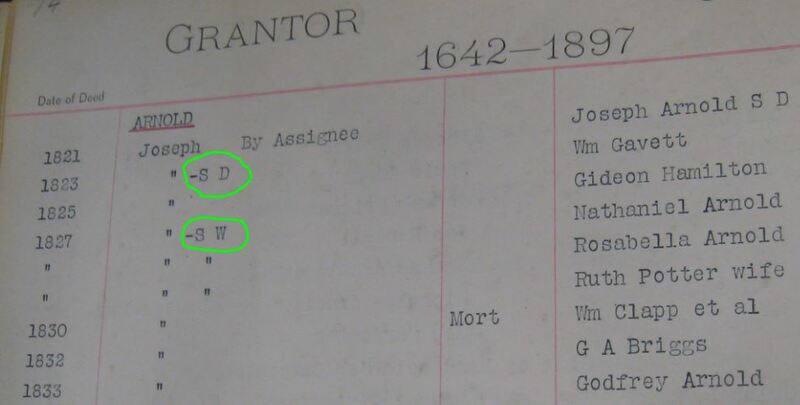 Russell was from Westerly, Rhode Island, and at age 32 in 1808 his father’s probate papers said he was “late of Westerly now residing in Norwich”, however census and town records show him moving between Westerly and Norwich several times. So the marriage at Preston could be because she was from Preston, or perhaps they were both originally Westerly residents. Lydia’s 1849 death notice gives her age as 62, making her birth (if true) around 1787. There was a Lydia Minor born to Jerusha Peabody and Ludowick Minor in nearby Stonington, Connecticut in 1787, however, I am pursuing another person that may be THAT Lydia. Look for probate for Lodowick Minor at Stonington. Keep pursuing the possible sister for Lydia, Eliza. A quote from Lydia’s 80 year old son, William, from the Norwich Bulletin, 12 Sep 1898, reminiscing with a friend about his mother. The article later makes it clear both families had 14 children each, in Lydia’s case, 7 boys and 7 girls. Sent to me by a kind researcher in Norwich. 6. Maria Shipley Martin (1848? – ?). Maria or Mariah Shipley Martin, my gg-grandmother, has a fascinating family tree that includes immigrants from Scotland and England who came to Nova Scotia in the 1700’s. So she is one of those mystery ancestors whose origins are well known, but she disappears from records after 1892, when her daughter got married at her home in Milton, Massachusetts. I suspect, by that time, she was separated from her husband, but I have never found any further record of her. Massachusetts was pretty strict about death records so perhaps she had gone with a relative to another state before her death, or perhaps she did, indeed, divorce and remarry. My family had no knowledge of this branch, so I have found the stories of her children Bessie (my great grandmother), Clara, Hazel and Daisy, but I have found very little about Minnie, May, and John Anderson Martin. keep looking for a divorce record in several counties. Look further for a second marriage in Massachusetts. Look for her death record at the NEHGS library in Boston. Try Milton, Mass. city directories. 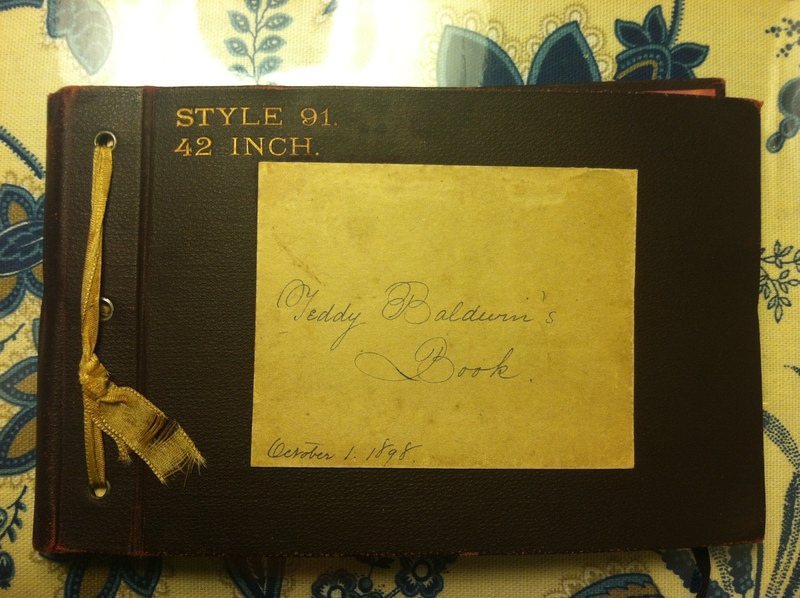 A book of her grandson’s Teddy’s sayings and some fabric scraps, put together by Maria’s daughters in 1898 after the death of daughter Bessie. 7. Nancy (——-) Lamphere (1752?-1833). Nancy may be a Tefft, but I have no confidence in that so I am open to all names. She married Daniel Lamphere around 1774 and had six children. The only records I have for her are her husband’s probate in 1808 (and later), a number of Westerly deeds that she is mentioned in, and the birth records of her children in Westerly. She may have died around 1833. If she was living next to her son Russell Lamphere in 1810 (perhaps in her third of the house), then apparently she was sometimes called Anne, an obvious variant that I haven’t been using very much. Explore middle names that were used by Nancy’s children for their own offspring. Do a thorough review of all the neighbors from early census records, and also those mentioned in the deeds. Look at the spouses of her children for possible connections. Transcription of Nancy’s mark on the 1817 deed to Nathan F. Dixon. So, Nancy was not able to write her name. 8. Rachel Smith (1734? – ?). I estimate that my 7th great grandmother Rachel was born around 1735 (based on first child born mid-1750’s), and signed a deed in 1768. She may have been a Smith. She married Thomas Arnold around 1754 and they had 5 children that I know of: Lucy, Asa, Catherine, Aaron, and Philadelphia. My most recent clue is that Thomas Arnold purchased some property from John and Mary Smith very early on in Smithfield. The children ended up in Cumberland, but the story of Thomas and Rachel seems to end around 1775 and although the children stayed in Cumberland, I can find no further trace of Thomas and Rachel – perhaps they died young. Truly, this one may never be solved which, of course, just seems like a fun challenge. Keep looking for the exact John and Mary Smith that sold land to Thomas Arnold, following clues in the deed, which I now have. Try looking at town council records for Smithfield. Smithfield records, held in Central Falls, will probably be the best source of Rachel’s family. 9. James Anderson (1748?-1796). With the help of some fellow researchers I know so much about my 5x-great grandfather James Anderson of Fells Point, Baltimore, later Chester, Lunenburg County, Nova Scotia. Usually, knowing this much should have led, long ago, to knowing about his origins, but not so in this case. His original family and place of birth remain a mystery. My cousins and I are focusing on DNA at this point. Of the latest clues uncovered here and there, the ones that seem the most realistic are for other, earlier Anderson privateers off the coast of Maryland. I may be able to explore those clues further in Maryland court records online, or at the Family History Library in Salt Lake City. Think about how to acquire further records which may be held in England. New York No 759. 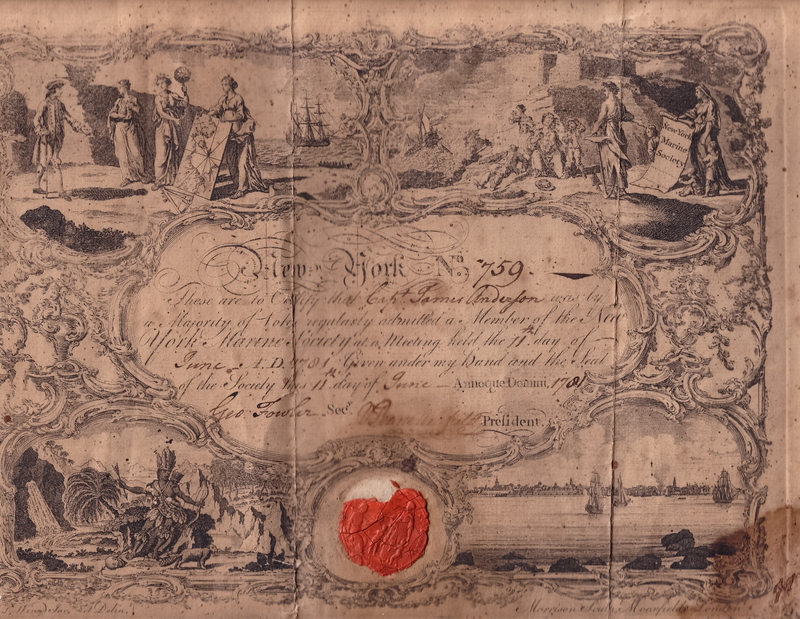 These are to Certify that Capt James Anderson was by a Majority of Votes regualrly admitted a Member of the New York Marine Society at a Meeting held the 11th day of June A.D. 1781 Given under my hand and the Seal of the Society this 11th day of June – Annoque Domini 1781. Geo. Fowler Sec. [illegible] President. 10. Nathaniel Brown (1741? – 1798). The last one is from my neglected line of Haydens/Parmenters, a closely intermarried family in Sudbury, Massachusetts that has not been that difficult to trace. Nathaniel Brown married Elinor Hayden in 1761 in Sudbury and was “of Framingham” but I know the neighborhood where my ancestors lived was right on the border between Sudbury and Framingham, so he may have been very close by. Nathaniel and Elinor had 11 children, and he died rather young in 1798. There is a strong theory that he is the son of Thomas Brown and Abigail Cheney, originally of Cambridge, but no real proof. And Brown was a common name in early Sudbury so anything is possible. Deeds and probate have not solved this yet. Go through Nathaniel’s earliest land transactions more carefully. He took over the farm of Elinor’s father, so the transactions are not that revealing. Could he have been a cousin? How did he have money for a purchase? Learn more about the early history of Sudbury and the place of the Browns in it. 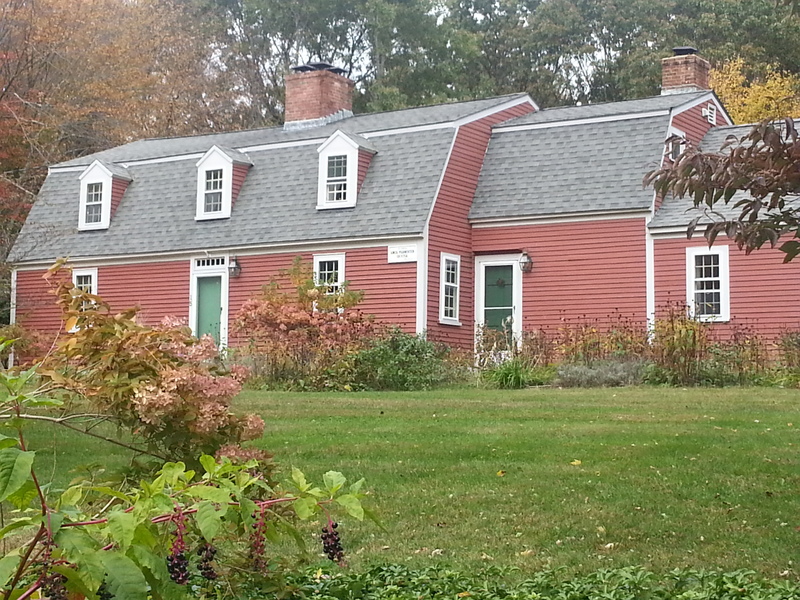 An early Sudbury house built by the Parmenters. Photo by Diane Boumenot. It’s possible I wrote this so I could choose my next project. Still not sure which it will be. Up until this point, I have concentrated on some good compiled sources on the Smithfield Arnolds (investigating the sources noted in footnotes), and some Smithfield deeds for Thomas Arnold, as well as all the usual sources one might pursue for this period. I have always been uncomfortable with how Thomas Arnold’s story seems to stop around 1776, and decided to pursue the history of each of his children, to see if I could find evidence of his subsequent life and a possible move away from Smithfield. There is no evidence that Thomas ever served in the military. Ultimately, my goals are also to determine if Thomas had dealings or proximity with Rachel’s family, and to find as many links as I can to Smiths, or any family that could be Rachel’s family. Cumberland Cemetery (CU003), Dexter Street, Cumberland, R.I.
Richard Benson’s book (see below) gives some information on the children of Thomas and Rachel Arnold. Lacking birth records for the children, he lists six possible children, gleaned from other sources, such as their marriage records, and records his sources and additional details in the footnotes, p. 242-243. Lucy Arnold married Richard Ballou around 1777. They had the following children recorded in Cumberland (Arnold, volume 3, p. 78): Marcy, Arnold, Lydia, Augustice, Thomas, Richard, Lucy, Willard, Polly Arnold. Phylia Collar, wife of Hezekiah Collar, died September 15, 1845 Aged 80 years 6 mo. The stone leaning up against hers is for Pardon Newell. I don’t know who that is. There is another Asa Arnold (son of Rufus Arnold and Ruth Eddy) who married Patience Read in Smithfield in 1797 and later moved to Painted Post, New York. That Asa had a daughter Dianna born around 1800 (same as Aaron, below) who married Paris Wheelock in Smithfield in 1818. Sometime after that, much of that family departed for Painted Post. Asa and Patience were buried in Corning, New York according to FindaGrave.com. So they were in Smithfield for most of those years. The marriage of “Asa Arnold of Smithfield, R. I., & widow Sarah Jacobs, Sept 14, 1788” appears in the Middletown, Connecticut section of this book: Early Connecticut Marriages as Found on Ancient Church Records Prior to 1800, Sixth Book, p. 109. Although the 1790 federal census record on Ancestry.com has some fading on the relevant page, “Asa Amasa Arnold” seems to be living there. A petition for divorce by Sarah, wife of Asa [Amasa] Arnold was filed in 1803; the papers are indexed in this volume from the Connecticut State Library, including a marriage certificate. I will be following up. The 1790 census shows an extra male under 16, and 3 extra females in the household; the 1800 census shows only the couple. Based on the bad behavior I noted in the divorce records, it’s hard to believe Thomas and Rachel ever came to live with Asa in Connecticut. After the divorce, Asa’s whereabouts are unknown to me, but he may have returned to Rhode Island. I do not know the names of children, if any. Catherine Arnold 1757 – ?, married 1777 Joseph Razee (1748-1814), son of Joseph, of Cumberland. According to Arnold’s Vital Records of R.I., vol. 3, p. 118, they had the following children in Cumberland between 1778 and 1788: Lucina, Rachel, Eunice, Aaron, William and Asa. 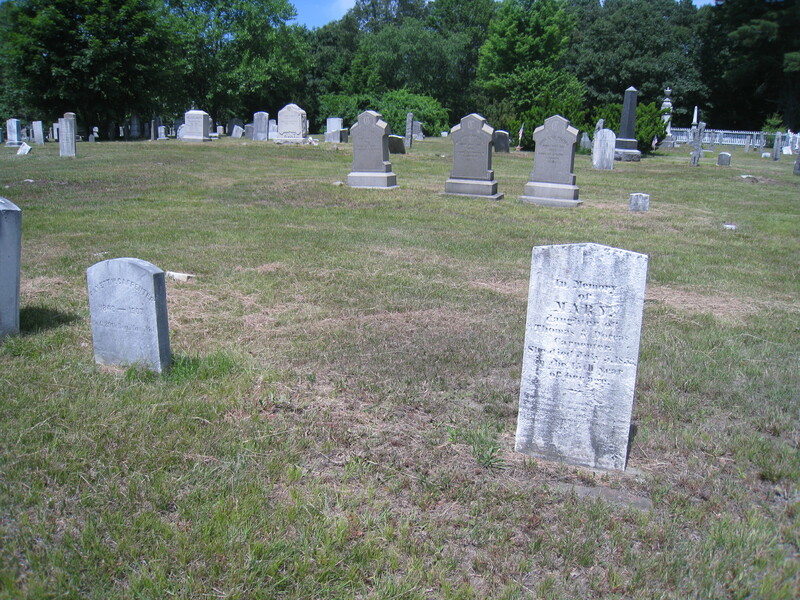 There is a Joseph Razey buried in the Ballou Cemetery on Mendon Road in Cumberland, according to FindAGrave. I have not yet found information about Catherine’s death or burial. Philadelphia Arnold (1765-1845) married Hezekiah Caller (son of Jonathan) in 1794. See notes, below. An examination of the federal census records for Cumberland in 1800 shows the adult couple with a boy and girl, each under 10. In 1810, the household consists of the two adults and a teenage girl. Hezekiah and Phylia Collar are buried in Cumberland Cemetery (CU003). It is south of the area where the Ballous and Aldriches lived. I do not know the names of children, if any. Lavina Arnold. Benson included this name because of a Quaker church record of Lavina “daughter of Thomas”. I’m not as convinced that any Quaker was part of this immediate family (and this name was not included in Welcome A. Greene’s manuscript, see below), and there were other Thomas Arnolds, but I will pursue the lead. I found a Revolutionary War pension file for Hezekiah, which led me to the version of his name used there, Hezekiah Collar (pension S-21138, Rhode Island, Fold3.com). From that (through FindAGrave.com), I found his grave in the Cumberland Cemetery with his wife “Phylia.” Using the extremely helpful Google Map of Rhode Island cemeteries, I located Cumberland Historic Cemetery 003, and visited there. Knowing from the pension file that Hezekiah reported himself as growing up impoverished, and that he substituted for others drafted during the war (something that usually involved a payment, so it was done by those needing money) there is no reason to think he inherited land in that particular area. I wonder if he purchased land in Cumberland – perhaps as a result of his Revolutionary War activities. Aaron Arnold served in the Revolutionary War as a seaman, and was on the Providence when it went to France. He was captured in South Carolina and imprisoned by the British for eight months in the Bahamas, 1780. The pension file says that he received a military pension beginning 1818. He died in Slatersville, R.I., 1829 “formerly of Cumberland”. Joseph Razee is hard to distinguish from his cousin of the same name (son of Benjamin) although the pension file in Fold3 definitely refers to the cousin. But the service records could be for both. So I am not yet sure if Joseph served in the war. The Ballou Cemetery, Cumberland Historic Cemetery 009, Mendon Road. The graves pictured are of some Carpenters. In my visits to the cemeteries pictured here, I looked around for Smith graves nearby. That was productive in the case of Cumberland Cemetery (CU003), Dexter Street, Cumberland, R.I., pictured toward the top of this post, where the Collars were buried. The neighborhood and the other graves had a familiar feel, like I was related to most of the people there. 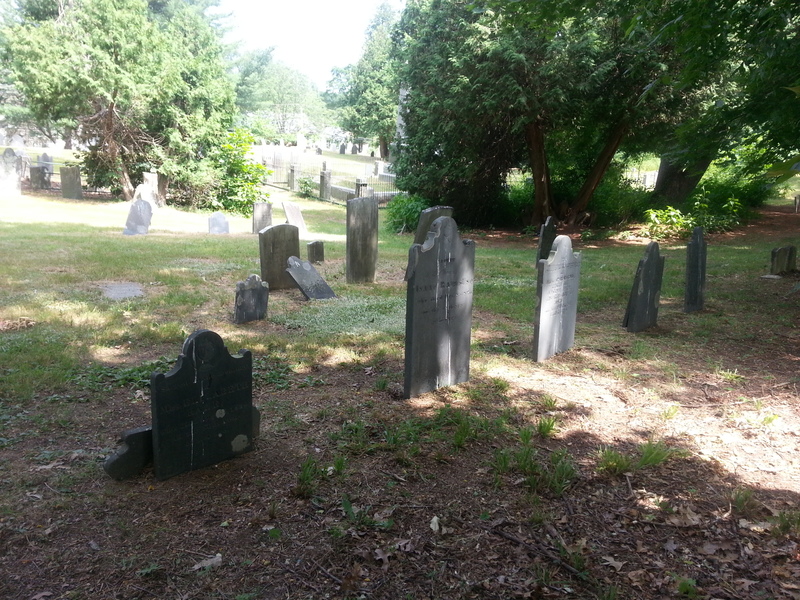 When I arrived at the Ballou Cemetery in Cumberland (CU009, intersection of Mendon Road and Scott) to find the graves of Joseph Razee and his wife Catherine, nothing felt familiar. The names seemed strange and the nearby roads and landmarks were not significant to me. 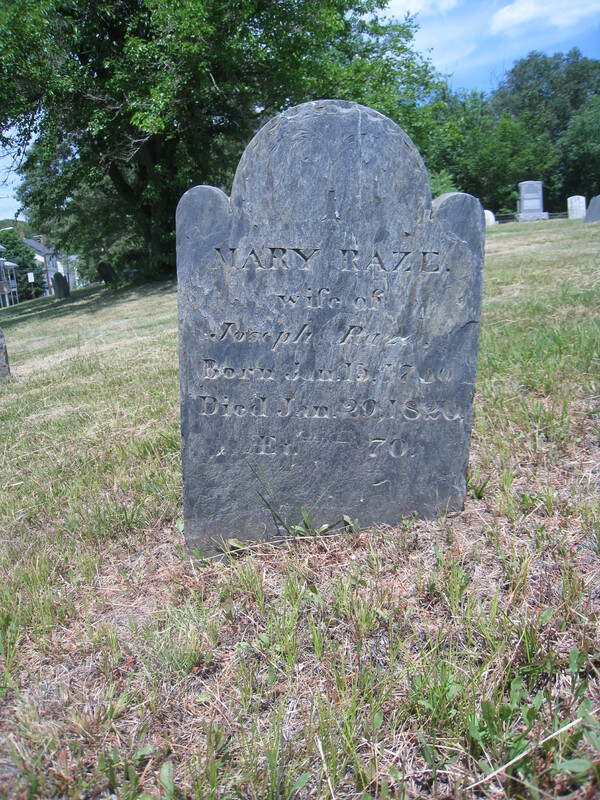 When I found the grave, it was for Joseph Razee, next to his wife, Mary. So that didn’t seem right. The gravestone gave a death date of May 8, 1814 (age 66, so born around 1748). There was a Revolutionary War marker by the grave. I returned home to look at the vital records a little more closely. Joseph Razee marriage entries in Cumberland portion of Arnold VR, vol. 3, p. 54. Joseph, 3d, of Joseph, of Cumberland, and Katherine Arnold, of Thomas, of Smithfield: m. by Stephen Arnold, Justice, May 18, 1777 (this was my Joseph). Joseph, of Benjamin, dec., of Cumberland, and Molly Nichols, of Samuel, of North Kingstown: m. by Elder Abner Ballou, Aug. 9, 1781 (this was the other Joseph, of the pension record). Joseph, Jr., of Joseph and Mary Razee, of David: m. by Isaac Razee, Justice, Aug. 18, 1808 (who was this?). So the question is, who was the Joseph in marriage number 3? Did Joseph in marriage 1 lose his wife and acquire a wife named Mary in 1808 (who may have been his first cousin), who later filed for the pension in 1843? The Fold3 pension record had a statement from the widow that she was called Mary, but had been called Molly earlier in life – so, that widow really seemed to be the one in marriage record two, not the third marriage. Arnold VR, volume 19 “Providence Phenix – Deaths” reports a Joseph Arnold died at Cumberland Dec. 8, 1816, age 70. That Joseph would have been born around 1746. The Joseph Razee who died in 1816 is buried in Peck Cemetery (CU019, Abbott Run Valley Road, Cumberland). That means that the grave I saw at Ballou Cemetery – pictured above – very likely WAS my Joseph. Next question – was it marked with a Revolutionary War marker because someone knows that he served, or because some well meaning person made a presumption that he was the other Joseph Razee? So I suspect marriage record #3 DOES refer to this couple in Ballou Cemetery, especially since my Joseph did not, according to the Cumberland records, have a son named Joseph. I know nothing about Catherine Arnold Razee’s death or burial. I checked the Revolutionary War pension file one more time to find the exact death date of the wrong Joseph Razee – and it was Dec 8 1816. Therefore, this Ballou Cemetery grave is for MY Joseph Razee. On a whim I visited the Peck Cemetery anyway, to visit the other Joseph Razee’s grave, because I like to see things for myself. I was surprised to discover his marker was near some Collar graves. Perhaps just a coincidence. There were Arnolds there too. 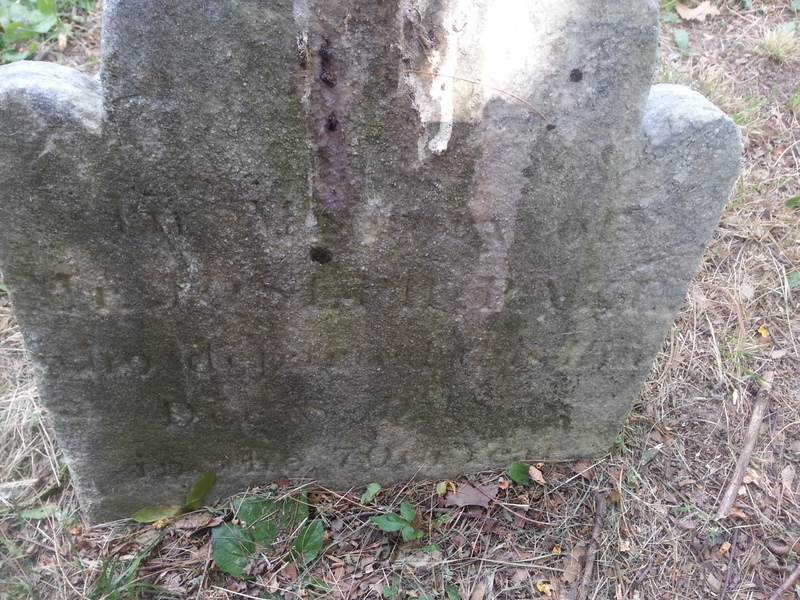 The marker was in tough shape, and had no flag next to it to mark a Revolutionary War soldier. But the stone was almost unreadable, so perhaps that was to be expected. 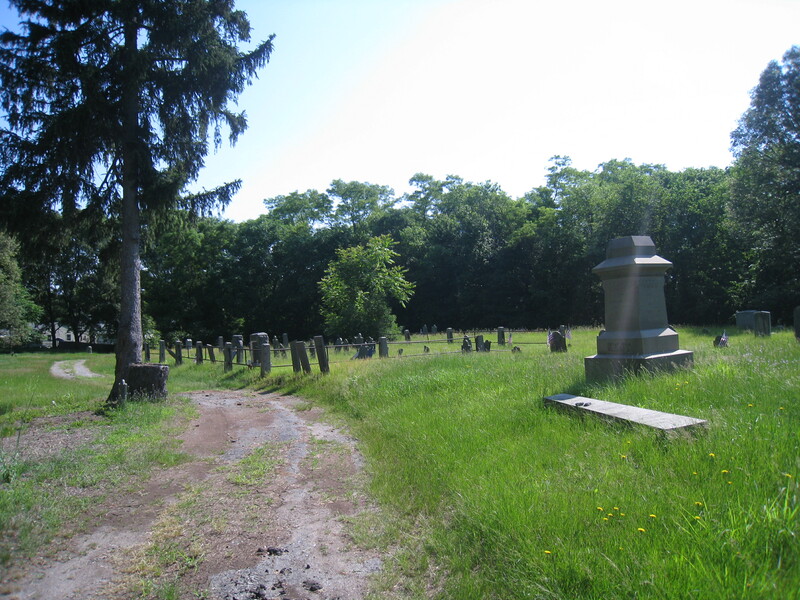 The Razee section of Peck Cemetery, Cumberland Historic Cemetery 19, Abbot Run Valley Road – note, Joseph Razee’s marker is just to the left of this row. While I have spent a lot of energy finding Joseph Razee, I still am no closer to knowing the fate of Catherine Arnold after her children were born. I feel badly because, all in all, I have to conclude the Revolutionary War marker is on the wrong grave, or at least on the grave of the Joseph who served far less. It should be on the Peck Cemetery Joseph Razee grave, pictured below (note: there is a far better picture of it on FindAGrave in which the medallion is still present). I checked out the NSSAR Patriot & Grave Record. Both Joseph Razees are entered as having marked graves, and apparently no membership applications have been submitted by their descendants. In Memory of Mr. Joseph Raze who departed this life Dec 8, 1816 in the 70th year …. Later, I tracked down some Smiths (from the cemeteries) in some usual Smith sources (see list, below). While not, in the end, leading me specifically to an answer, I am beginning to know much more about the many connections between the Arnolds and the Smiths, and to distinguish the various branches of the Smiths and Arnolds. Benson’s The Arnold Family (see below), Richardson’s History of Woonsocket (see below) and the John Smith articles by Farnham (see below) are making a lot more sense to me as I recognize many of the individuals named. 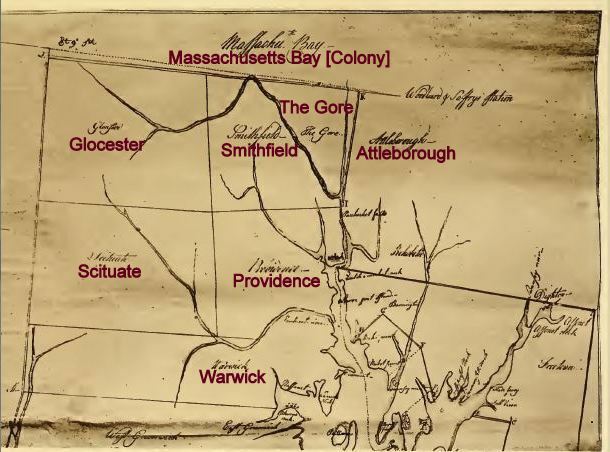 When I encountered, for probably the fourth time, the 1748 list of Smithfield Highway Districts (Richardson’s History of Woonsocket, page 64-68), I realized that the physical descriptions of each area are now very recognizable to me. Previously, I was mostly trying to examine names. I would estimate that Rachel was about 14 years old in 1748, and her father could easily have still been alive, or if not, her mother or brother could have owned property. So I am planning a more detailed analysis of that list, and, as luck would have it, I have also stumbled upon an 1806 geographically-sorted Smithfield list that I will place on the blog at a later date. As I drove home from these Cumberland cemeteries, I passed through historic areas of Smithfield and North Providence – historic homes, Great Road, Old Louisquisset – and began to get a clearer view of the generation after generation march from Providence north. Thomas and Rachel’s children headed north into Cumberland – and perhaps Thomas and Rachel went with them as they got older. 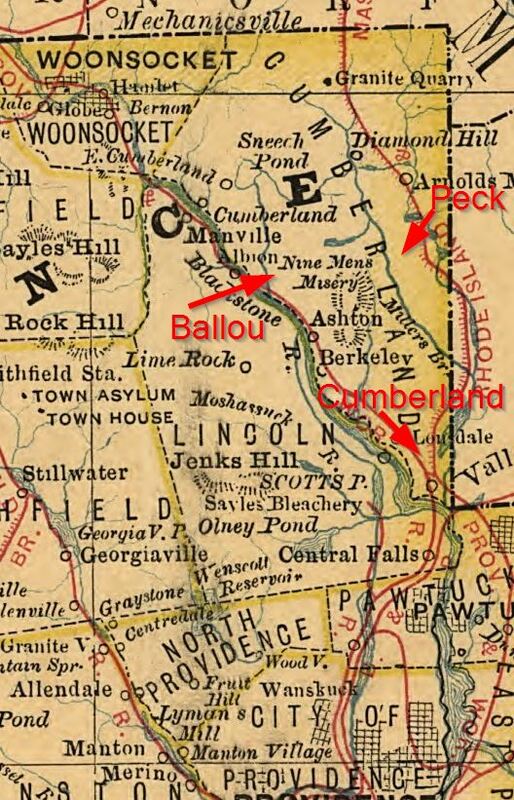 The three cemeteries mentioned here in eastern Cumberland – from the northeast corner of Rhode Island on the 1875 Rand map. Revisiting my chart of Thomas Arnold’s deeds recorded in Smithfield, the names now seem more familiar, and the John and Mary Smith who sold Thomas his first piece of land seem like a HUGE clue, that I am having trouble tracing. I think the time has come to visit the old Smithfield records at Central Falls, Rhode Island and examine these deeds in person (I had previously captured them from microfilm), along with any probate records I can find. The deeds show that Thomas Arnold sold the farm he lived on in 1772, and the deeds appear to end completely around 1776, when his children were quite young. Daughters Lucy and Catherine married around 1777; did the remnants of the family follow one of them? It’s like they disappeared. I have managed to convince myself that none of Thomas Arnold and Rachel Smith’s children left northern Rhode Island, with the possible exception of son Asa. As I visited cemeteries and town halls it occurred to me that only the early portions of this story were happening in Smithfield – the later portions were all in Cumberland. The two most likely possibilities are that Thomas and Rachel died quite young, in Smithfield, or they moved in with one of their sons or daughters in Cumberland. Analyze each census record for the children to see if there are extra adults in the household. I will also be tracing the John and Mary Smith mentioned in the Smithfield deed of 1764. It is difficult to trace Rachel since she was born in the early 1730’s and the Smithfield records only begin in 1730. It occurs to me to try the earlier Providence records. I may go to the Providence City Archives for that. Knowing Rachel’s first name (the SMITH is a bit speculative, based on what the books say) I have the idea that if I locate the vital records for THOMAS’ parents, whether they be in Smithfield records or in Providence, I should look around for Rachel’s family nearby. Judge Benjamin Cowell, the author of this work, which was published by him in 1850, was born in Wrentham, Mass., in 1781, and died in Providence, R. 1., May 6, 1863. He graduated from Brown University in the class of 1803. He studied law and settled in Providence. For a long term he was pension attorney for this district. During this long term he became acquainted with many of the old soldiers and he could, from his large mass of anecdote and collections, have produced several very interesting volumes. The partial list he published was perhaps an afterthought with him in late life for, had he commenced with his first practice with the object 1n view of publishing later, he would have had an immense manuscript which to-day would be priceless. – Fold3.com (a paid subscription site) is a terrific source for Revolutionary War information. Angell, Frank C. Annals of Centerdale in the town of North Providence, Rhode Island. Central Falls, R.I.: Frank C. Angell, 1909. Ballou, Adin. An Elaborate History and Genealogy of the Ballous in America Providence: E.L. Freeman & Son, 1888. Bamberg, Cherry Fletcher. 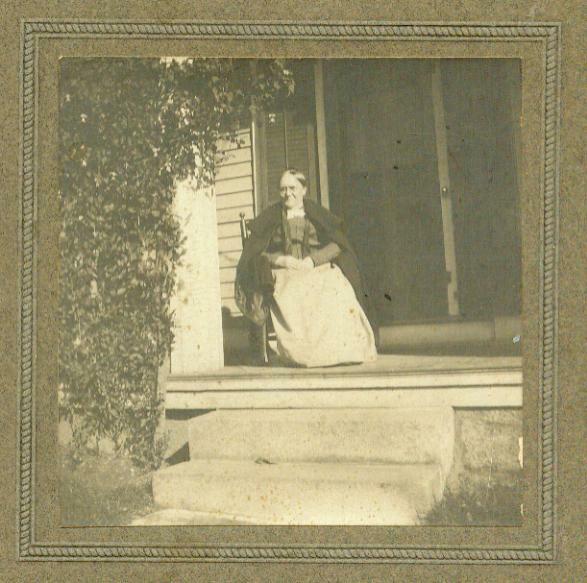 “Amy (Smith) Russell and Her Family.”Rhode Island Roots 37, No. 2 (June, 2011): 57-78. Bartlett, John R. (arranged by). Census of the Inhabitants of the Colony of Rhode Island and Providence Plantations … 1774. Providence: Knowles, Anthony & Co., 1858. Benson, Richard H. The Arnold Family of Smithfield, Rhode Island. Boston: Newbury Street Press, 2009. Cowell, Benjamin. Spirit of 76 in Rhode Island, or, Sketches of the Efforts of the Government and People in the War of the Revolution. Boston: A.J. Wright, 1850. Farnham, Charles William. “John Smith, The Miller, of Providence, Rhode Island – Some of His Descendants” in Genealogies of Rhode Island Families From Rhode Island Periodicals, volume II, p. 1 – 150. Baltimore: Genealogical Publishing Co., 1983 [originally appeared in the 1960’s as a series of articles in Rhode Island History, v. 20 – 24]. Greene, Welcome A (1795-1870) Notes on the Genealogy of the Arnold Family. Manuscript C5859, New England Historic Genealogical Society Library, Boston. Thomas Arnold is person 6114. Heads of Families at the First Census of the United States Taken in the Year 1790 – Rhode Island. Baltimore: Genealogical Publishing Company, 1977. Richardson, E. History of Woonsocket. Woonsocket: S.S. Foss, 1876. Sanborn, Melinda Lutz. “Smithfield, Rhode Island Death Records Culled from Probate.” New England Historic Genealogical Register, October 1992, p. 343-351. “Smithfield 1778 Tax List” a series of articles in Rhode Island Roots (a periodical from the Rhode Island Genealogical Society), 1995-1997. Steere, Thomas. History of the Town of Smithfield. Providence: E.L. Freeman, 1881. For further information on the various Arnold families in Rhode Island, see my post Meet the Arnolds. I realized recently that I hadn’t really explored the journal of the Rhode Island Historical Society Rhode Island History (1942 – present). There is a good index at the RIHS website. I started with the index, but I also downloaded (from the screen just mentioned) and perused the complete pdf table of contents for the issues online (seems to include all issues minus most recent five years). The full issues are available online. When an article of interest is found, the issue it’s contained in can be downloaded from the search results screen for free. As I perused Rhode Island History an article about the Arnolds of Smithfield (1) caught my eye. 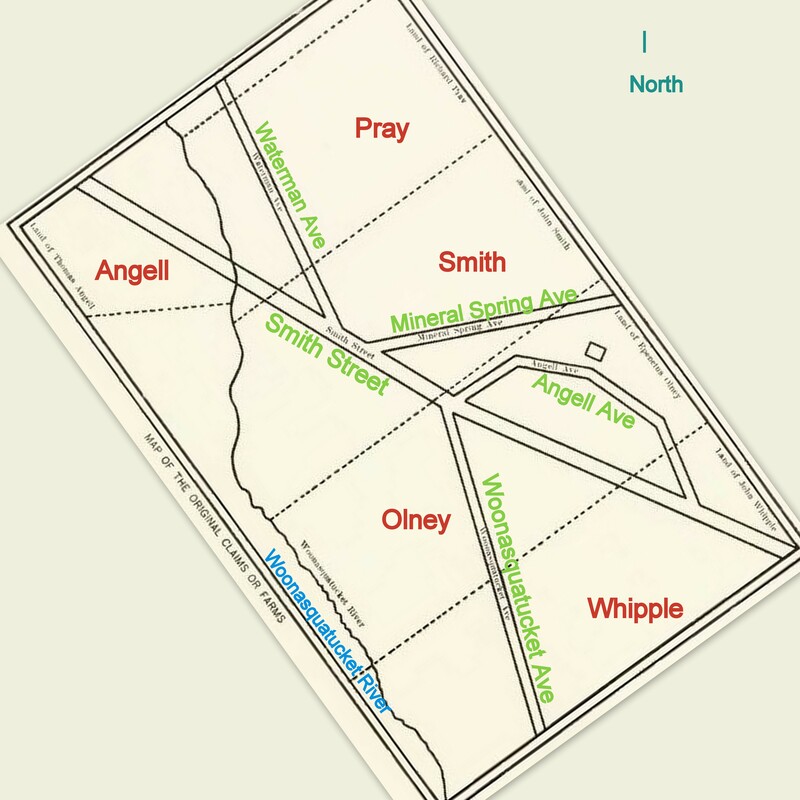 The article was interesting and informative, although it contained one or two errors that I know were corrected in the newer, standard work on the Arnolds of Smithfield by Richard H. Benton (2). As the article progressed it veered off from my line toward the better-known Eleazer Arnold line, and some of his descendants (the author was detailing his wife’s lineage). That’s not particularly helpful to me. But I did what I always do — I examined the footnotes. Each person covered had a set following their entry. In the first three generations, I was familiar with all of the sources (many of them were covered in this post about early R.I. research) but one of them struck me as something I had not seen before: Annals of Centerdale by Frank C. Angell, 1909 (3). 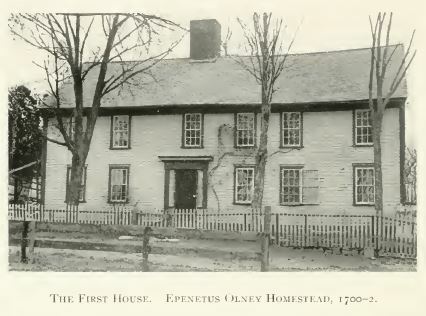 First house in Centerdale, Epenetus Olney Homestead, 1700-02. Annals of Centerdale, p. 24. It would never occur to me that Centerdale could hold any answers for me; I thought my Smithfield ancestors were farther from Providence than the tiny old mill hamlet of Centerdale, nestled in the urban clutter of North Providence, Rhode Island. But as the original Providence settlers spread west and north, could they have stopped for a generation or two in the area that became Centerdale? I found the book remarkably interesting. 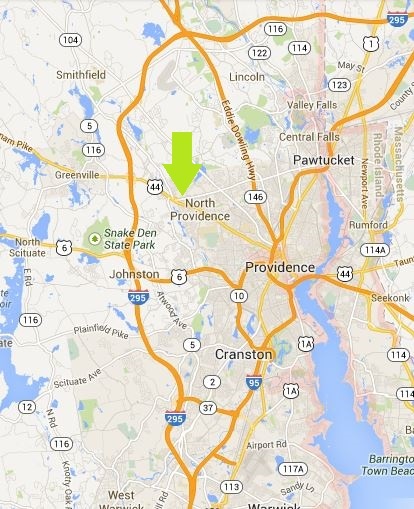 As I read it, I realized that my entire Arnold line, which had originated in Providence among the Angells, Prays, Woodwards, Comstocks, and Browns, seemed to appear in this northwestern corner of early Providence. And SMITHS were intermingled with them on every page. 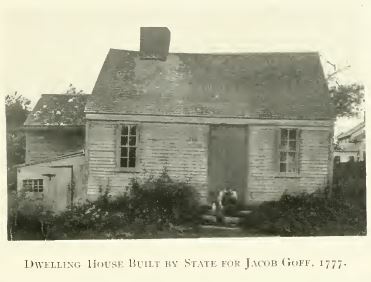 The dwelling house built by the state for Jacob Goff, 1777 – part of the state’s attempt to establish a powder mill in this area during the Revolutionary War. It was a spectacular failure; read more in Annals of Centerdale, p. 35. I have no information about Rachel Smith at all, other than her first name, which appears on some of her husband’s deeds, and the oft-repeated rumor of her last name being Smith. So I was excited to find all these Smiths amongst the Arnolds. Today Centerdale is halfway between Providence and Smithfield, Rhode Island. map courtesy of google maps. It began to seem very possible that the great-great-grandchildren of the Centerdale settlers could, after the families had moved farther up the road to Smithfield, have married. Armed with this clearer understanding of the Smiths I did not have to look far for some further help with the descendants of John Smith, the miller. There in Rhode Island History I spotted an article “John Smith, the Miller, of Providence, Rhode Island, and some of his Descendants” by George William Farnham (5). It appeared in 1961. Articles on this topic continued for a total of 16 issues between 1961 and 1965. 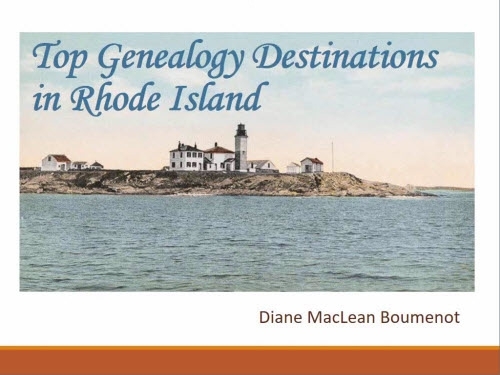 I had previously seen these in Genealogies of Rhode Island Families (4) but only used the index, and decided it was not helpful. I think these days I would take a more studied approach to figuring out who these descendants were, and where they were. I would also check closely for any Smith associates I have found, meanwhile, for Thomas Arnold, for instance, from his land records in Smithfield. The articles are fascinating, detailing the life of John the miller (early John Smiths in Providence are always referred to by occupation) and many descendants in the first five generations. The first mill was an important part of early Providence, and located at the intersection of Charles and Mill Streets. The articles are filled with discussions of evidence, quotes from notable books, and information gained from town and court records, newspapers, and manuscripts. I now realize I don’t actually know that much about the patterns of expansion from the earliest Providence settlement into the remainder of what is now known as Providence County. Looking at the Centerdale book and some additional sources, I have learned a lot about the Seven Mile Line and the fights during the 1660’s to retain control of Providence among the wealthier landowners only – legal maneuvers that were very troubling to Roger Williams. More on that in the future. Meanwhile, I have some John Smiths to investigate. Pitman, H. Minot. “Some Arnold of Smithfield, R.I.” Rhode Island History 13-4 (October 1954): 111-123. 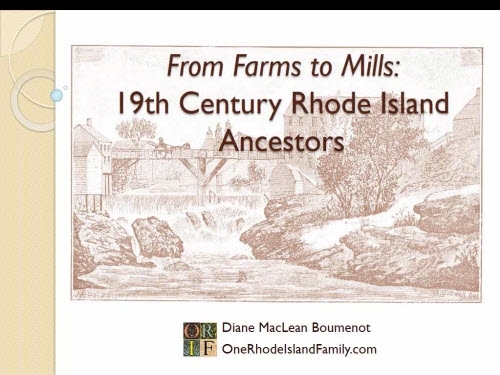 Genealogies of Rhode Island Families From Rhode Island Periodicals, vol. 2, Smith – Yates. Baltimore: Genealogical Publishing Co., 1983. p. 1 – 150. 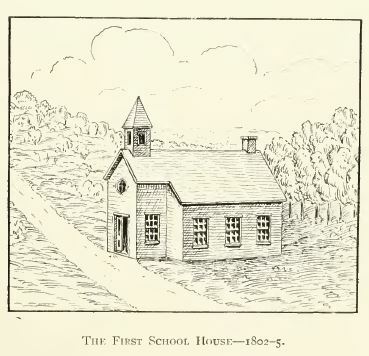 Centerdale School House. Annals of Centerdale, p. 69. Since post one and post two on Lucy Arnold, I have been unable to pursue most of the on-site research I need to do, but I have pursued some research on a number of collateral lines that I was able to do from home. whether Lucy Arnold is the daughter of Thomas5 (Thomas4, Richard3, Richard2, Thomas1) and Rachel. the likely family of Thomas’ wife, Rachel (possibly Smith). “Thomas [Arnold] purchased 4 acres of land from Thomas Smith on 20 June 1767” (p. 242). Looking around, I find a Smithfield land owner named Thomas4 (Thomas3, Edward2, Christopher1) Smith, (1697-1777), who was the son of Thomas and Phebe (Arnold) Smith. Thomas Smith would be Thomas Arnold’s second cousin once removed. Thomas Smith was a Quaker who married twice and inherited Smithfield property from his father, and his birth in 1697 is noted in Benson’s Arnold book. It’s doubtful he is Rachel’s father because I think this would have been caught by now, but it would be good to pin down exactly who the seller “Thomas Smith” was. Like most early Rhode Island residents, the Arnolds were opposed to the various New England authoritarian churches. Some of the Smithfield Arnolds were Quakers, and were instrumental in establishing a Meeting in Smithfield. My branch of the Thomas Arnold family were driven out of Massachusetts after they became Baptists. They settled in Providence and later Smithfield, Rhode Island. The Ballous were active in the Six Principle Baptist Church in Cumberland. 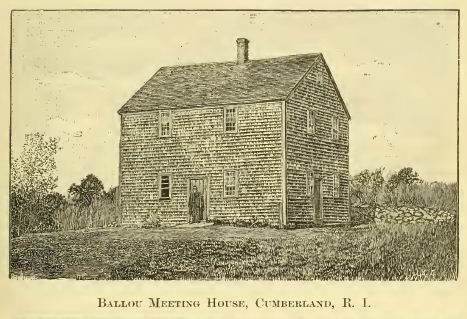 Elder Ballou Meeting House, Cumberland, R.I. In line after line of the ancestors of these Ballou, Arnold, and Aldrich families, who all ended up in Smithfield/Cumberland/Wrentham, I notice that many branches came from nearby Mendon, Mass. Other branches were among the original founders of Providence. In terms of narrowing down the Smiths, this means that Rachel Smith could possibly have been descended from a Mendon family of Smiths, as well as several early Providence Smith families. I suspect that if my current lead about the land transaction is a dead end, it may take me a long time to prove anything about her. The Ballou book (see below) has become more and more valuable as I attempt to place these people in a historical context. For the first time, I realized that the discrepancies I see about Cumberland, R.I. and Wrentham, Massachusetts are because it was the same place. 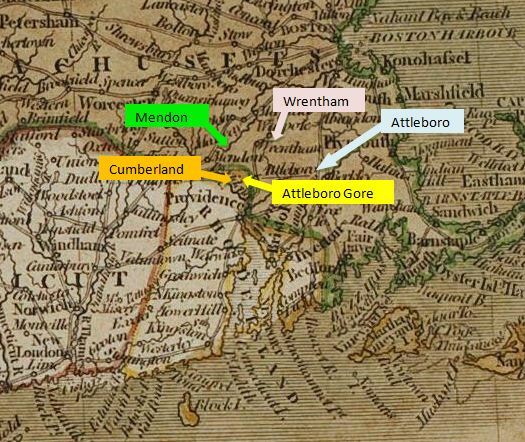 I knew that “Attleboro Gore” was a Massachusetts settlement that transferred to Cumberland, R.I. around 1745; what I didn’t realize was that the Cumberland section my ancestors lived in WAS Attleboro Gore. This will help me to further investigate land records. Comparing family connections among the Thomas Arnold (1733 – ) and Richard Ballou families has resulted in lots of distant connections, none of which seem significant. I believe Richard Ballou acquired his property through his own family (NOT from his wife’s father), but I need to look at each of his deeds. Find old maps of the households in Attleboro Gore/Cumberland. Austin, John Osborne. The Genealogical Dictionary of Rhode Island, with Additions and Corrections by John Osborne Austin, and Additions and Corrections by G. Andrews Moriarty. Baltimore, Genealogical Publishing Company, 1969. Greene, Welcome Arnold. “Notes of Genealogy of the Arnold Family.” Unpublished typescript based on a manuscript complied starting in the 1840’s. 1914. Knight Memorial Library, Providence. [photocopy accessed at the NEHGS Manuscript Collection]. Torrey, Clarence Almon. New England Marriages Prior to 1700. 3 volumes. Boston, New England Historic Genealogical Society, 2011. After my previous work on Lucy Arnold I decided to accept, for now, the consensus reached during my consultation at the NEHGS in October, which is that Lucy may be the daughter of Thomas and Rachel (Smith?) Arnold, as found on page 243 of The Arnold Family of Smithfield, Rhode Island by Richard H. Benson. I thought I could look at details of that tree and perhaps get a sense of whether this particular Lucy Arnold’s family seems to fit with the branches that I am already sure about. Last Friday I read some articles from Elizabeth Shown Mills’ new “Historic Pathways” website. I found them inspirational. I especially enjoyed In Search of “Mr. Ball”: An Exercise in Finding Fathers. The moral of THAT story was, perhaps you can’t find the records for a family because the family never existed. Also, “missing” information may simply be missing from the index. Do your own record perusal. And analyze your evidence early and often. One factor that stood out in many of her articles was the staggering level of detail she attained while researching these lives. She knew the neighbors, the history, the towns, the relatives, the businesses, and the geography. Do I know all of that on my difficult problems? Heck, no. So I stepped back to learn a little more. I read an 1881 book from Archives.org called The History of the Town of Smithfield, Rhode Island by Thomas Steere. Genealogies of Rhode Island Families From Rhode Island Periodicals, 2 volumes, Genealogical Publishing Company, 1983. Dennis Darling of Braintree and Mendon and Some of his Descendants, 2006. Benson, Richard, The Arnold Family of Smithfield, Rhode Island, 2009. Ballou, Adin, Ballous in America, 1888. I have to admit prior to this “background check” I didn’t realize how many of my ancestors had Smithfield ties. The Arnolds, Aldriches, Browns, Smiths and Comstocks are everywhere. Not much overlap for a relatively small town. But, I’ll want to learn exactly where those Whipples lived. John and Mary Smith? oh goodie. can’t wait! 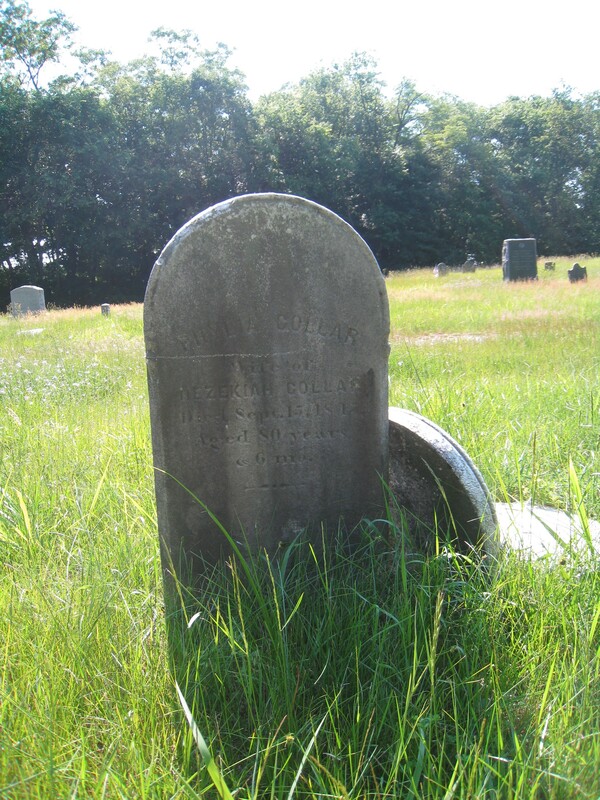 Richard and Lucy Ballou are not in the popular Rhode Island Historical Cemeteries Database Index. But I need to find strategies to try and find their graves since they could possibly be near Lucy’s relatives. Lucy’s possible grandfather Thomas Arnold Sr. is buried in Union Cemetery. I guess I’ll check out who’s there with him and go from there. Armed with this additional background, re-examine Richardson’s History of Woonsocket when I am in Boston in early January. 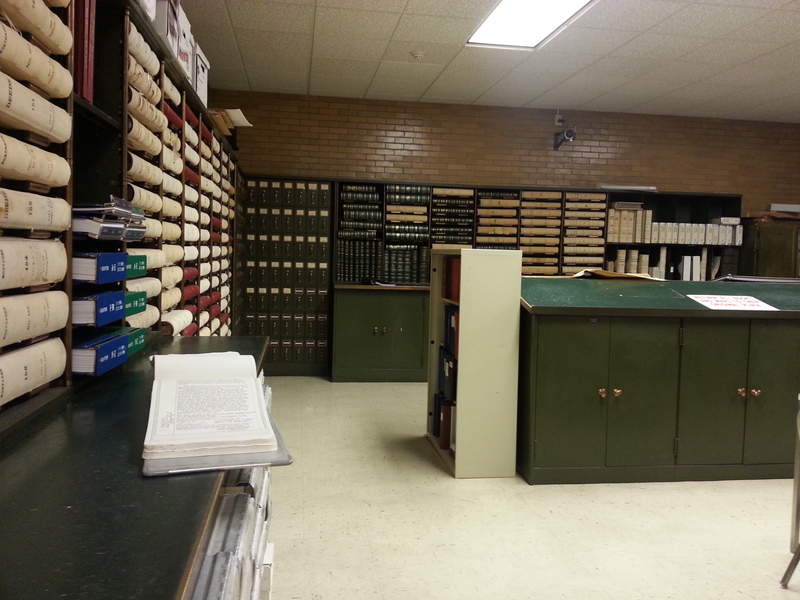 The Rhode Island Historical Society Library has an extensive Quaker collection. I may try to learn more through that. My family says it’s Christmas. Gotta go. Wonderful New Year to all!